The Deseret News printed scores of articles written with the Deseret Alphabet. It did so somewhat sporadically over the course of three years - 1859, 1860, and again in 1864. 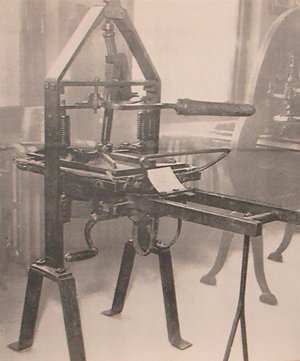 The Deseret News was first published with a Ramage Printing Press as shown in the picture to the left. If possible, I recommend taking a visit to the Crandall Historic Printing Museum in Provo Utah. They have a replicas of the original Deseret News press as well as several other historically significant printing presses. The guided tours are fascinating as well as educational. It is an excellent museum and well worth the visit. The articles are arranged chronologically and grouped by year. I have begun transcribing the articles from Deseret to Roman, and those transcriptions are paired with the original articles as you can see below. I will transcribe more articles in the future as time permits. The articles consist of scriptural quotations. There are some minor, but surprising, differences between our modern scriptures and the Deseret verses. The punctuation and capitalization of the transcriptions reflect that of the Deseret articles. "We present to the people the Deseret Alphabet, but have not adopted any rules to bind the taste, judgment or preference of any. Such as it is you have it, and we are sanguine that the more it is practised and the more intimately the people become acquainted with it the more useful and beneficial it will appear. "The characters are designed to represent the sounds for which they stand, and are so used. Where one stands alone, the name of the character or letter is the word it being the only sound heard. We make no classification into vowels, consonants, &c., considering that to be of little or no consequence; the student is therefore at liberty to deem all the characters vowels or consonants or starters or stoppers or whatever else he pleases. "In the orthography of the published examples, Webster's pronunciation will be generally followed, though it will be varied from when general usage demands. All words having the same pronunciation will be spelled alike, and the reader will have to depend upon the context for the meaning of such words. "Since the arrival of the matricies, &c., for casting the Deseret Alphabet, it has been determined to adopt another character to represent the sound of EW, but untill we are prepared to cast that character, the characters [Deseret ih oo] will be used to represent the sound of EW in NEW. The Characters [Deseret aa eh] are sounded as AI in HAIR, for whitch one character will also be used, so soon as it can be procured."